﻿ How to obtain citizenship en Grenada? How can I obtain a Panamanian passport? How can you obtain a Panamanian passport? The mechanism that is issued the most is applying for an independent retiree visa, through which you receive a Permanent Resident Permit and also a passport (you aren’t a citizen, which means that your actual citizenship will appear in the Nationality section of your passport). The main requirement demanded by Panama for granting the independent retiree visa is to have a certification which vouches that the person receives a minimum monthly income of 2,000 USD which derives from a fixed-term deposit of 800,000 USD to 1,000,000 USD, made at the Panama National Bank or the Savings Bank. This income must be free of all taxes or guarantees of any kind. Generally, everyone can apply for the independent retiree visa in Panama, although only 70% of the presented cases are actually validated, while 30% are denied. The following appear among the documentation needed for applying for this type of visa which leads to the Panamanian passport: a medical certificate of good health; your criminal record from your country of residence for the last five years; also, a copy of your criminal record issued by the Technical Judicial Police of Panama. It is also essential that you present a valid passport plus the original and copies of all of its used (stamped) pages; two sets of copies of the entire passport, authenticated in front of a Notary Public in Panama; four passport-sized photographs and two sets of copies of the entire documentation. All documents that have been obtained outside of the country will have to be authenticated by the Panamanian Embassy or Consulate in the country that has issued said documents. The independent retiree visa in Panama is initially granted for five years, but it ca be extended although, in order to receive said extension, the person has to present the certificate that vouches that he continues to receive the minimum income required, starting from the fixed-term deposit that must be kept in the Panamanian Bank. 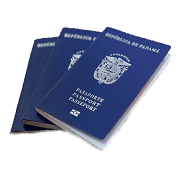 A Panamanian passport is very useful, because it is possible to travel to more than 100 countries without the need of a visa; in addition, counting on a second passport, a person feels safer, since he can avoid controls and can enter and leave countries where it had been impossible with his previous nationality. 1. Power and application through an attorney. The power must include the complete name of the interested party’s parents, and all of the attorney’s general information (office address, phone number, fax number and P.O. Box, if he has one) must be specified in the request; all documents that are attached and the point of law. 2. Medical certificate of good health, issued within three (3) months prior to the presentation date. The certificate must include the signature and stamp of the doctor, with his name, code and registration number. 3. Proof of HIV test (SIDA) done within six (6) months of the presentation date. The certificate must specify the method used and bear the signature and stamp, with the name, code and registration number of the lab tech that carried out the test. This requirement is not necessary for children under 12 years of age. 4. Criminal record from the country of origin (only when the interested party has resided continuously in Panama for less than 5 years). 5. Original passport, with a minimal validity of six (6) months. 6. Four (4) passport size photos. 7. Certificate issued by the Panama National Bank where it vouches that the interested party receives a minimum monthly income of seven hundred fifty Balboas (B/. 750.00) deriving exclusively from interest produced by fixed-term deposits, free of all taxes or guarantees of any kind. The mentioned fixed term must be a minimum term of five (5) years. 8. A photocopy of the Fixed-term certificate or Contract, authenticated by the Panama National Bank. 9. Two (2) sets of photocopies of the entire passport, authenticated by a Notary Public. 10. Two (2) sets of additional ordinary photocopies of all documents presented except for the passport. 1. Each adult dependent will have to grant Power to the attorney, and the parents must grant it in representation of their underage children. 2. A medical certificate of good health, issued within three (3) months prior to the presentation date. The certificate must include the signature and stamp of the doctor, with his name, code and registration number. 3. Proof of HIV test (SIDA) done within six (6) months of the presentation date (the certificate must specify the method used and bear the signature and stamp, with the name, code and registration number of the lab tech that carried out the test). This requirement is not necessary for children under 12 years of age. 4. Criminal record from the country of origin (only when the interested party has resided continuously in Panama for less than 5 years). This requirement is not necessary for underage children. 5. Two (2) sets of photocopies of the entire passport, authenticated by a Notary Public. 6. Two (2) passport size photos for each dependent. 7. Original passport, with a minimal validity of six months. 8. Documentary proof of relationship: marriage certificate or birth certificate. 9. Letter of responsibility of the main principal interested party toward each dependent. 10. Two sets of additional photocopies of all documents presented except for the passport. Note: All documents that were issued abroad must be presented duly authenticated, whether by an “Apostille” issued by the country of origin or by the Panamanian Embassy or Consulate in the country that issued them and by the Panamanian Department of State. ARTICLE 197. The withdrawal of the fixed-term at any time after the first five (5) years and the non-compliance with the terms stated in Law n.9 of 1987, this Executive Order and these regulations will cause the loss of the incentives and rights that said Law grants. 1. Bank certification of the Panama National Bank or the Savings Bank, that the amount of the fixed-term is accredited, the interest that it generates, its duration and that it is free of burdens. 2. Copy of the fixed term certificate authenticated by the bank. 1. Peace and safe national with income in favor of the interested person. © 2018 OPM CORPORATION the specilists on Second Legal Passport, Second Citizenship, Dominican Republic Citizenship, Panama passport, St. Kitt & Nevis passport, Dominica passport, Second passport, Diplomatic Passports, Venezuela citizenship, جواز سفر ثاني قانوني, Приобрети второй паспорт.